Continuing our inquiry into Listening, this blog post focuses on the deep listening that begins at Level 3. I will complete this series with Part 4, Listening for Being, in our next post. This four-part blog is called ”Commitment of Listening,” quite different from “Skills for Listening” or even a “Capacity of Listening”. To engage deep listening from commitment requires a practice of observing first your own listening. That is, when I am engaging another person, what are my constraints to listening? We have many such constraints such as defensive filters, points of view, frames of reference, worldviews that shape implicit biases, and triggers, and coping strategies to compensate for being vulnerable. 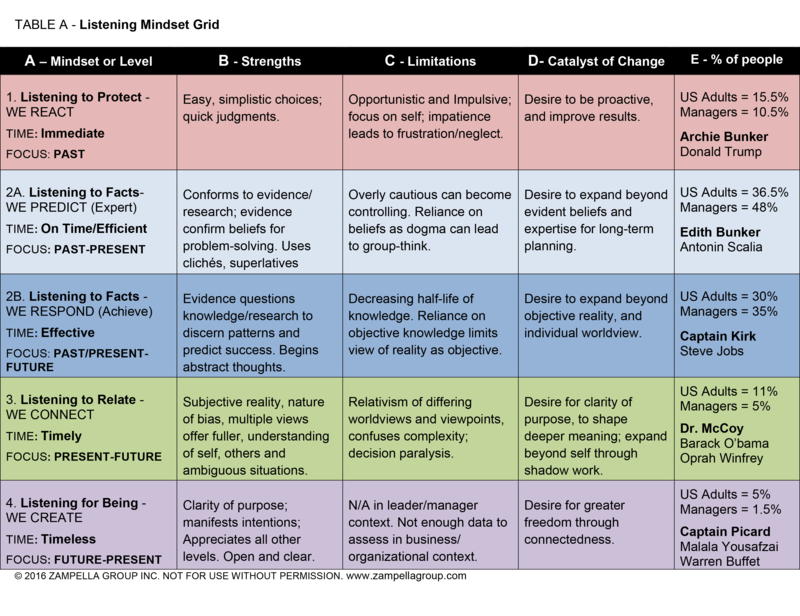 Recall Table A below that illustrates the five levels and four mindsets from Part two of this series. I offer the explanation for Table A in Part two of this series. So then, when we engage listening, what is our commitment? Are we committed to our agenda, our feelings, our comfort? Is it to win, to control circumstances, to support our point of view? Is it to achieving some result? These commitments sustain us at level 2a or 2b (Table A above). But if our commitment is to be open, and to connect and experience another person newly, then we will expand our listening. If Level 1 listening is habitual, and Level 2 listens through empirical knowledge, then Level 3 includes subjective experiences and multiple viewpoints. The act of listening, as a commitment, may sound simple, but it is hardly easy. To explore commitment is to explore our relationship to change; these questions define our current and emerging worldview. Today, a commitment of listening requires an openness to change. To begin, let’s expand our view of change itself. We tend to hold a view of change, reflexively, as “the unknown” or as disorderly — to be resisted unless necessary. Consider your answer to the question, posed by philosopher Jiddu Krishnamurti, Why don’t you change? When we hear that question, we may relate to it as fixing, correcting or improving something or someone from a state of something’s wrong, or inadequate or broken. Even if we know better intellectually; viscerally, we tend to resist anything resembling change. We can experience our own resistance by observing our openness and acceptance to the unknown. Change occurs in every living system. Most of the cells in our body are renewed every 7–plus years. Viewing change as a natural part of life begins with accepting it as necessary to grow (expand abilities), to adapt (integrate new complexity) and to evolve (include new views). Resisting change is to resist life. It consigns us to stagnation: insulated or isolated from an evolving world. Stagnation leads to decay, which accelerates death. Absent our biological mortality, decay can kill off our will or spirit by settling into resignation, cynicism, or complacency. Being fulfilled finds us living in the dynamic flow of life: receiving new ideas, learning from our experiences, expanding our views, and letting go of beliefs that isolate us. 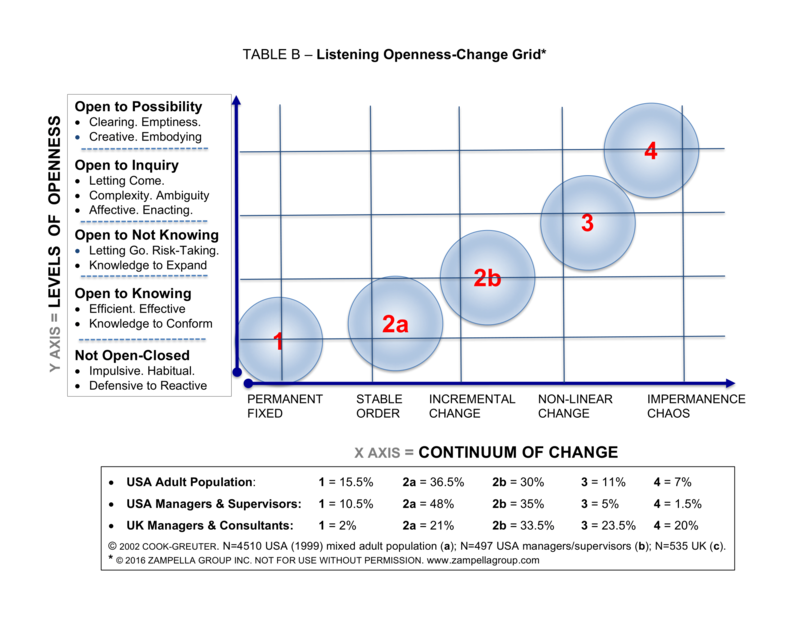 The X and Y-axis in Table B (below) point to two human fundamentals openness and change that intersect to expand our listening. The “Y” Axis (vertical): labeled openness ranks our open-mindedness to uncertainty. Researcher, Otto Scharmer views openness as open mind, open heart, and open will. At the bottom of the axis we are not open (or closed-minded). Then we become open to knowing, receiving what’s provable or concrete. The next level is open to not knowing; here we begin to value subjective experiences and multiple views. Open to inquiry holds questions, tensions, and paradoxes, often for a lifetime. Einstein’s question, “What is the nature of reality?” guided his life and created new fields of scientific inquiry. The final level is open to possibility is to be freely open. Our level of openness discloses our capacity to experience anything, newly, to accept a fresh or new perspective on ideas, concepts, viewpoints, people, experiences — viewing the familiar with a fresh perspective, etc. What level of openness do we bring to situations or circumstances? The “X” Axis (horizontal) labeled continuum of change defines our view of change. The axis begins (far left) as fixed and permanent. This view rejects change. The next view stable-order perceives an orderly world with an occasional change. Then we see incremental change. This view accepts change as regular, but as extrapolated from the past to manage and leverage. The view of non-linear change underscores change as normal and as unpredictable. Then finally impermanence expands “now” (this moment) to embrace the order in chaos, which, ironically, finds change disappearing as a concern. As revealed in Table B above, we gauge our level of change by our willingness to move beyond our comfort zone and into the unknown. For instance, how do we adjust to new technology or applications, move into a new residence, or consider taking a new route home? Do we plan our lives as if things are permanent? Do we include or ignore regular change in our plans? Do we only accept incremental improvements? Consider that nothing stays the same: knowledge, technology, resources, circumstances, companies, relationships, systems, science, ideas, views, or beliefs. In sum, Axis Y reveals our openness to uncertainty, and Axis X discloses our acceptance of the unknown. Table B distinguishes the pace at which we receive, accept, integrate, and adapt learning to manifest change. What we are stating here is that the leap to level 3 listening, held by approximately 11% of the adult population and 5% of U.S. managers, requires more than skills; it requires a threshold leap, an openness to uncertainty and the unknown. See frames and practices in Table C (below) to better understand the subtle frames, views, and attitudes that can constrain and expand our listening. Use Table C (below) as the counterpart to Table A (above in the blog). Column A lists levels (5) and mindsets (4) of listening, and also lists a communications narrative at each level. For instance, at Level 2a, “I debate others,” informs the frames and attitudes in Column B. Column B reveals the Frames for each level. The bolded words – Impulsive, Empirical, Competitive, Cooperative, and Integral – captures the fundamental focus of listening at each level. The other words, such as Win-Lose, Success-Fail, Problem-Answer at level 2b, frame concerns that drive that level’s listening. Column C reveals our attitudes, and popular examples (note my Star Trek/All in the Family references). This is outlined in our last post. These prevalent attitudes such as, “I am right,” or “I am not bad,” (level 1), match the frames in Column B. Practice listening to yourself as you interact with others to experience any frames and attitudes. Column D lists practices at each level. When practiced, we engage each level fully, and also prepare for the next level. It is important to say a word about practice. We do not suggest practicing to achieve some goal, or to achieve “perfection” (whatever that is). We practice to practice. Column E is a reminder from last blog of the adult population and the U.S. managers at each level. Recall, 66.5% of our population and 83% of managers listen from level 2a or 2b. This is organizational life. Finally, here’s an interesting item: Once we observe and experience our own listening, and then engage the practices, we loosen its grip on us. The loosening of Level 2 listening is challenging and most important, as it represents a large part of our organizational life. I assert that the shift from Level 2 to Level 3 listening may be the fundamental learning of our time. 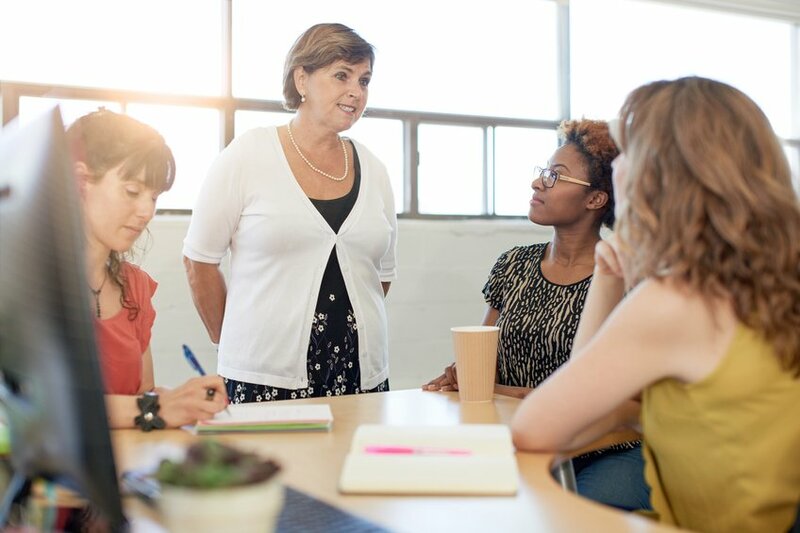 As learning and development professionals, many of us are moved to explore the level of suffering experienced in organizations, whether in business, education, nonprofits or government. People, today, are more anxious and connected, but less focused and related. As staff, supervisors, and line workers, we do not feel heard, appreciated, or acknowledged, nor do we feel empowered to act. As employers confronting disruptive change and complexity, we are overwhelmed, without time to reflect, or engage necessary conversations. Urgent becomes the norm, and we are anxious at how to increase productivity, and ensure accountability without stressing our staff. As leaders, we cannot share our deep concerns, and are often alone in our confusion. It is challenging to find the time or commitment to engage differing views or the necessary input that is critical, strategically. Or to connect with others in ways meaningful to engage stakeholders and align culture. Level 3 listening begins with empathy. For most, empathy is an emotion or set of feelings that places us in another’s shoes. As a feeling, this is a somewhat reduced view of an empathic mindset. Empathy can be a skill, but as a mindset empathy or empathic listening is fuller, and transcends emotions and feelings. An empathic listener can appreciate multiple perspectives, traverse frames of reference, and relate beyond a single worldview. These listeners have a deep interest in multiple viewpoints to connect to another as a legitimate being, from a we-space that involves deeper understanding, respect, and appreciation for different cultural and societal norms. While understanding how another person feels can happen at any level of listening, accessing the world that they live in – not as their interpretation, but – as a legitimate view is at the heart of Level 3 listening. A – Knowing vs. Learning: This level is a critical threshold. These listeners are willing to hear new ideas. This is different than turning something new into something we already know. By definition, this is not receiving an idea, newly, as it reduces “differences” to similarities, and compares new ideas to what is already known, thought, or believed. 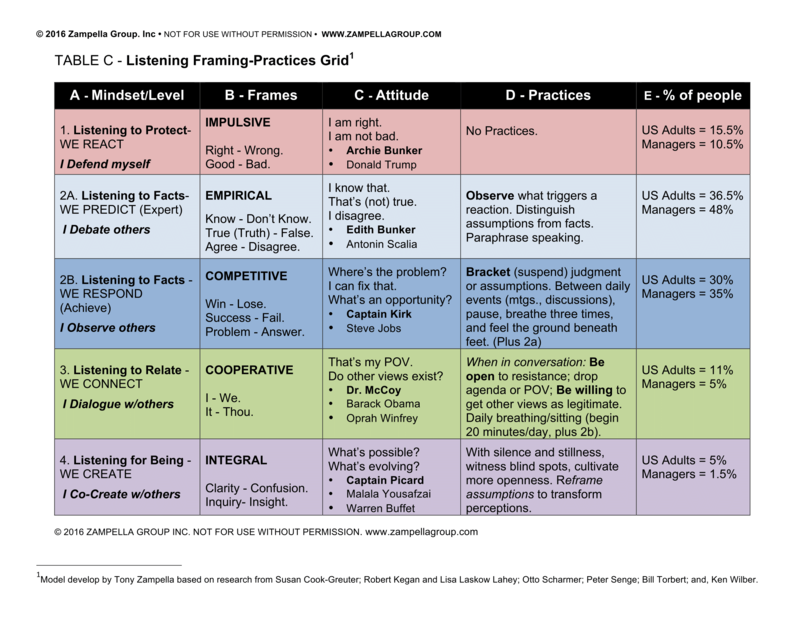 Fixed “knowing” listening patterns are the most challenging to transcend, and keep us at level 2a or 2b. In this way, we never really get beyond our knowledge and are trapped in a past of our own making. As the world continues to change, we continue to dig in. B – Bracket What We Know: To shift out of the level 2, the listener must begin practicing (Table C) what philosophers call bracketing – setting aside viewpoints, judgments, and positions — to let in something new. Level 3 listeners expand or even upend their knowledge by adding new ideas. They are open to “not knowing,” (see Table B) which allows for differences in perspectives, worldviews, and viewpoints. C – Beyond Simplistic to Complexity: That “equal weight” Tribe refers to about Barak Obama is an example of the added effort, care, and interest at Level 3. Previous listening mindsets view others objectively. This view relates to others, either tolerating differences but not as equal, or viewing everyone as “objectively,” the same without any differences. The Level 3 embrace of complexity rejects the sameness of everyone and instead appreciates differences while honoring the legitimacy of each view. This includes a level of complexity and ambiguity, perceiving subtle or nuanced differences that are critical to building trust and being related. Such a view allows for deep levels of respect, appreciation, and empathy for subjective experiences, even if not fully understood. At this level, we cooperate without needing to understand or share the same viewpoint. D – Dialogue is important for Level 3. These listeners lead with questions to understand (Level 3) as opposed to needing to understand to question (Level 2). Paraphrasing Peter Senge, ‘dialogue’ is the capacity of members of a team to suspend assumptions and enter into a genuine ‘thinking together,’ allowing the group to discover insights not attainable individually. E – Deep Listening: The ability to embrace other viewports as legitimate opens us to “Deep Listening.” Jiddu Krishnamurti, the philosopher, who himself listens at Level 4, and who collaborated with David Bohm, wrote about Level 3 deep listening in a beautiful way. “I do not know if you have ever examined how you listen, it doesn’t matter to what, whether to a bird, to the wind in the leaves, to the rushing waters, or how you listen in a dialogue with yourself, to your conversation in various relationships with your intimate friends your wife or husband. Our next post, part four of this series, will offer a glimpse into Level 4: Listening for Being.